Atlanta’s St. Patrick’s Day parade dates back to 1858, started by a Catholic and Protestant fraternal organization ( The Atlanta Hibernian Benevolent Society ) . For a complete history of the parade, click here. 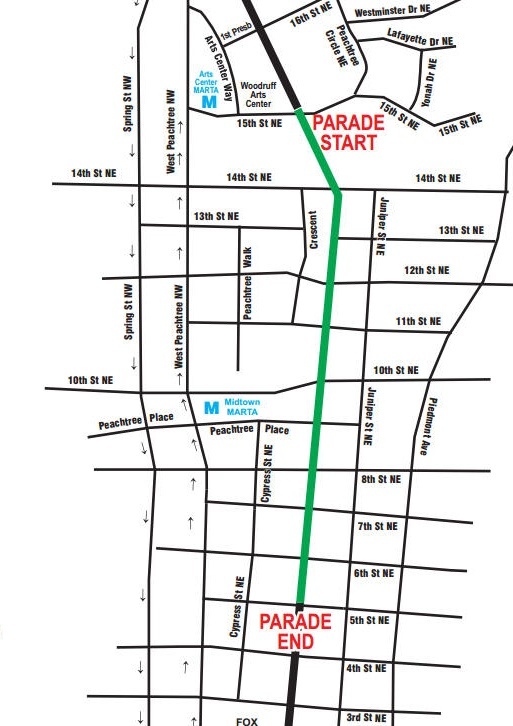 The Parade will travel through Midtown Atlanta on Peachtree Street, starting at 15th street and going south along Peachtree Street to 5th street. View a larger printable PDF version PDf the Atlanta St. Patrick's Day Parade Route Map here. If you want an interactive Google map, so you can get directions to some point along the parade route, click here! If it is a cold day, bring a warm hat, warm gloves, and warm shoes. For a sunny day, you’ll want to bring sunglasses, suntan lotion, and a hat. The parade goes on rain, shine or snow. MARTA is a great way to get in and out to see the parade. The Midtown and Arts Center stations are located along the Parade route. If you are considering driving, the One Midtown Plaza off of Arts Center Way, the Colony Square parking deck on 14th, the Campanile parking deck on Juniper, the Proscenium parking deck on Crescent and the Promenade II parking deck on 15th will be open for a fee, typically $10 to $20. For more information about getting around in Midtown, click here. View a full list of street and lane closings here .